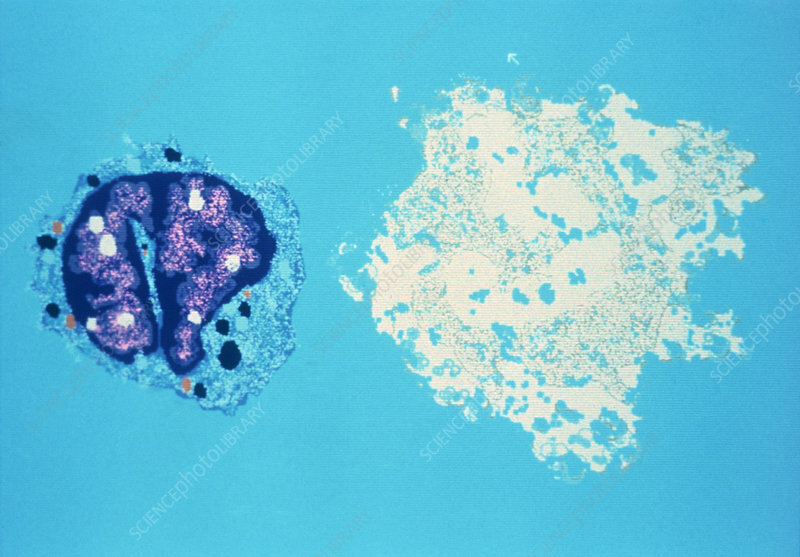 False-colour transmission electron micrograph (TEM) of a single, activated cytotoxic ("killer") T-lymphocyte (left, a type of white blood cell) after delivering the "kiss of death" to its target cell (debris at right). T-lymphocytes are part of the cell-mediated immune response to invasion of body by foreign microorganisms, notably viruses and some bacteria, which are protected from antibodies (secreted by B-lymphocytes) by their host cells. T-cells recognize antigens on their target cell and release enzymes that disrupt the target cell membrane causing the cell's ultimate destruction.